The pastor of a Maryville, Illinois, church was shot to death during a service Sunday in front of horrified parishioners who then tackled the gunman, state police said. Fred Winters, the pastor of the First Baptist Church of Maryville, was shot and killed during the 8 a.m. service, and the attacker and two parishioners suffered knife wounds in the attack, Illinois state police spokesman Ralph Timmins told CNN affiliate KSDK. The gunman walked in during the service and walked up to the pulpit, opening fire when he was met by Winters, Timmins said. A Maryville police dispatcher told CNN the pastor was shot three times. The suspect then pulled out a knife and wounded himself, Timmins said. Two worshippers who were attempting to detain him were also injured by the knife. St. Louis University Hospital spokeswoman Laura Keller told CNN three males, including the suspect, were brought to the hospital. One was dead on arrival, she said, but the hospital was not releasing names and ages. The second was in an operating room and the third was the suspect, she said. The suspect’s condition was not immediately available. 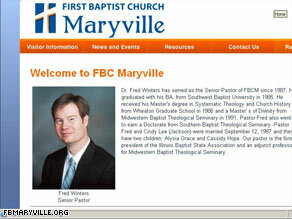 Maryville is about 10 miles east of St. Louis, Missouri.